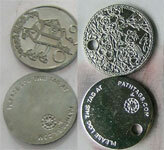 Pathtags are made using a process almost identical to that of most Geocoins, Challenge Coins, Hat Pins, and other stamped and enameled colored products. Each tag is custom made to order for the customer. This guide walks you through the full production process step-by-step. Starting from the time you create your order until you get your tags in the mail. 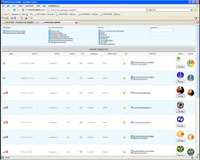 Paid orders pop up in our back end order processing system. A sneak peek is pictured here - it's not as pretty as our main site :) Using our processing system we will review the design for any obvious problems. If we need to, we will email you to get clarification. Barring any issues, we send the original artwork in to be turned into a production blueprint. This usually takes 1-3 business days. The waiting begins - but it won't be long. Keep a close eye on your email account. 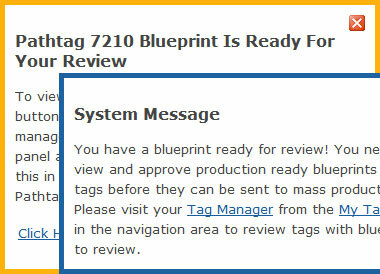 You will receive a notice when the blueprint is ready for your review. The process can't proceed until you review the returned blueprint. Common Question: When do I submit payment? You submit payment at the time of order. 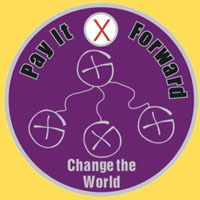 Once we receive the order and the payment, we will send the design to be blueprinted. If you do not like it - you can request changes or even submit an entirely different design by emailing orders@pathtags.com. When it's ready, your blueprint will be posted for your review. You'll get an email notice when it's ready. This image is the actual blueprint that was made from the original. Look at it closely - notice any small changes to this sample blueprint from the original above? First - the color is a bit different. Not every color exists in the PMS color language. In this case, the closest approximation was used in blueprinting. Also - the words "Change the World" were too small to make colored. They were changed to raised metal. They will be perfectly legible in the final project. You are probably noticing that the light gray represents "raised metal". 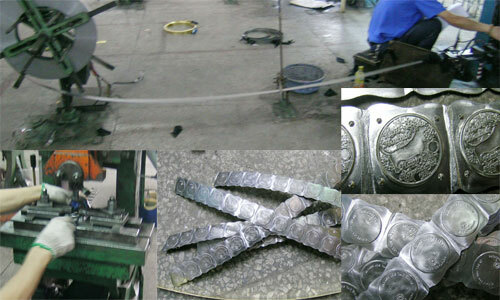 Tags are made by stamping a design into iron, plating the iron disk, and coloring by filling recessed areas with enamel. This is a method similar to what is called "cloisonne". Raised metal rims have to be made to hold the enamel. 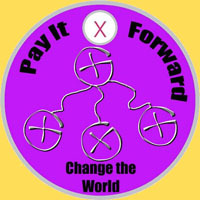 Notice the words "Pay It Forward" were just black in the original? In the production-ready blueprint, raised metal outlines have been added to those letters to hold the enamel. The bottom words are just too small to accommodate both raised outlines and color enamel filling. Keep in mind - this design will be produced on a disk about the size of a quarter. What looks big in design is often too small to accommodate in production. This is why all designs go through the blueprinting process. To review your blueprint, log into your account. You will get a notice that your blueprint is ready to review. Navigate to "My Tags" and you will see one of your tags highlighted in blue. Click that tag to open the review form. The review form shows you a large view of your blueprint for review. It also includes a legend with the standard colors used to show raised and recessed metal for your chosen plating color. NOTE: If you have used enamel colors very close to those which we usually use to represent metal coloring we may slightly change the colors used to represent metal. The legend is just a guide. If the blueprint looks good, click the link to accept the blueprint and you're all set!. We'll get the notification and your tag will be in production at the factory usually within 1 business day. After that - get your patience ready, it'll be 4-6 weeks before your tags arrive on your doorstep. If the blueprint is not up to your expectations, click the link to reject the blueprint and write a note in the provided field so we know what to change. We'll get your notes and will contact you to discuss tag revisions and/or post an updated blueprint. Blueprints and revisions are usually posted 2-5 days after a request, depending on timing (holidays, weekends, etc.). Usually within hours of your blueprint approval, the factory creates the die for your design. The die is made from a blank steel plate, the result is a "negative" of your design. The die is used to strike a blank, leaving your design behind. At this point, any changes in your order will result in a minimum $50 change fee up to the full value of your order. The further in the process your order gets before we can stop progress, the higher the change fee. This is why it is very important to ensure your tag is exactly as you want it when you submit your approval! 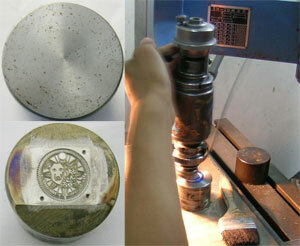 Once the die is created, your custom front-side die and our standard reverse side is loaded into a stamping machine. A factory technician feeds long strips of iron through the stamping machine. The result is a long strand of your tags all still connected together and without the hole punched. As you can imagine - this part of the process happens pretty quickly! They literally "crank out" your tags and then send them off to be plated. The enamel for your tags is applied by hand by a human! Using a syringe, the skilled technician applies enamel coloring carefully to each and every one of your tags! 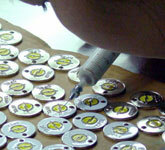 This process is obviously time consuming and can consume 80% or more of the required production time for your tags. The more complex your design, the longer it takes to enamel them. Tags are then taken and engraved with your serial number and enameling is inlaid to the engraved number. Your tag is then inspected and packed at the factory and shipped to us in our regular shipments. We receive your tags, inspect them one more time, and ship them to you. After a few weeks of patiently waiting on pins and needles for the final product of your own personal metal masterpiece - the Pathtags Stork comes. Well... at least the postman does! And you'll receive not only your shiny new tags, all individually wrapped for their protection, but a velvet bag to put a bunch of them in and carry with you. By now - you probably have gotten several emails from excited collectors asking to trade. Even if you didn't turn your tag on for trading yet! Now that you have your tag, you're ready to start enjoying all the great features of the Pathtags Community. Take the Community Tour to learn about all the great features of our online Community site.